With the advent of the HP Deskjet Printer, quiet printing at 300 dots per inch (identical to Laser printers) just became available to those of us who don't have bottomless pockets. The Deskjet features fast printing, single-sheet feeding and graphics output unmatched by any other printer in this price range. The Deskjet has a standard Centronics parallel port as well as a serial port for connection to your ST. It uses inkjet technology, in which the ink is sprayed onto the paper through tiny holes in the combination ink cartridge/print head. When the ink is used up, you simply throw the whole print head away and install a new one. 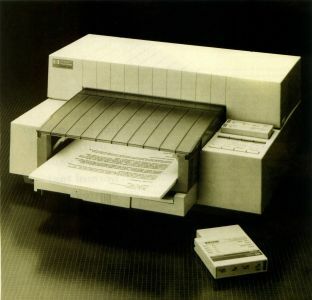 Unlike some earlier inkjet printers, however, the Deskjet does not require special paper, and is quite fast—240 characters per second in draft mode. Only single-sheet paper (either 8.5 x 11 or 8.5 x 14) can be used—there is no way to use tractor feed paper. However, you can feed envelopes without removing the single-sheet paper—which is very convenient. Try feeding envelopes into your dot-matrix printer! The front panel of the Deskjet includes buttons to cycle the printer on- and offline, eject a sheet of paper, switch print modes (draft or letter quality) and switch fonts. The printer comes equipped with normal and condensed Courier fonts built-in and plug-in font cartridges can be purchased. You can also purchase a RAM cartridge for downloading fonts to the printer. The Deskjet is quiet. It is just barely audible while printing, primarily due to the paper-feed mechanism. It certainly is a pleasant change after the constant whine of my 9-pin printer. But the test of any printer is, of course, its printing, and it is here that the Deskjet really shines. It is designed to work just like HP's famed LaserJet II, and will accept commands from any program with a LaserJet driver. While there are currently few of these, professional quality programs such as Migraph's Easy Draw, Neocept's WordUp and TimeWork's Desktop Publisher STall include LaserJet drivers. Further, it is no more difficult to construct a custom printer driver for the Deskjet for your favorite word-processing program, than for any other printer. The excellent manual includes all the command codes for italics, bold, condensed, etc. Letter-quality printing is virtually indistinguishable from a daisy wheel printer, just as it is with a Laser printer. When printing graphics with Easy Draw's Deskjet driver, the output quality is absolutely stunning. In fact, any GEM format picture (such as those output by Migraph's Supercharger) will print out beautifully on the Deskjet, since GEM format pictures will print out in whatever resolution the printer is capable of. This is unlike graphics packages such as DEGAS, where the print-out is limited to the resolution of the screen (about 72 dots per inch). In fact, the combination of Migraph's Supercharger, Easy Draw and the new Deskjet driver work so well together that Migraph has decided to market the Deskjet and is advertising it through their user newsletter. The package containing the Deskjet and the driver is available for a limited time for $949. What you give up when you buy the Deskjet (instead of a LaserJet) is speed. While a LaserJet can produce a page of complex graphics in about a minute, the Deskjet can take four times this long, or longer. With the purchase of an inexpensive printer buffer (or by using part of your ST's RAM as a buffer), you can continue to work while the printer churns on. Further, because the Deskjet accepts data from the printer line by line (instead of a whole page at a time like the LaserJet), you can print out a whole page of graphics without the extra two megabytes of memory required by the LaserJet. Purchasing this extra memory raises the cost of a LaserJet to about $3,000, so the Deskjet costs only about a third as much. I'll give up the speed to save $2,000! Also available from HP is an Epson FX-80 emulation cartridge that plugs into the Deskjet. This cartridge works very well, printing text and graphics from every program I tried, including the ST screen dump and GEM graphics from Easy Draw using an FX-80 driver. DEGAS also worked well. This cartridge makes it possible to use the Deskjet even if your favorite program doesn't have the proper driver. I like the Deskjet a lot. I wish the paper tray had a larger capacity, and the mechanism does jam on occasion. But overall, it is sturdily built, small, quiet and relatively fast. Some 24-pin printers are faster, but they are noisier and don't have as good a resolution. I'm not going back to my old printer.